it burns. it will produce a good gravy & must remain boiling till this dries up again then till the pan with a tea kettle of boiling water. let it boil - skim it well & then let it simmer upon a hot plate for six hours stewing gently Strain it off through a [tammey?] thrown on a sieve, leaving the meat & a little of the gravy in the stew put in a few fresh vegetables & herbs & 1/2 as much more boiling water & let it stew till the last thing at night for a second sort. During the time when the first sort is making put all the bones into boiling water with fresh herbs & vegetables & let them boil the whole day. This third sort will when cold be a stiff jelly & I believe is to be the ground work of the soup whatever soup it may be whether white or not for white soups should be rather whity brown than dead white, & any white meat pounded & rubbed through a Tammey will make it sufficiently so -- white of egg may be used with advantage to increse the whiteness. 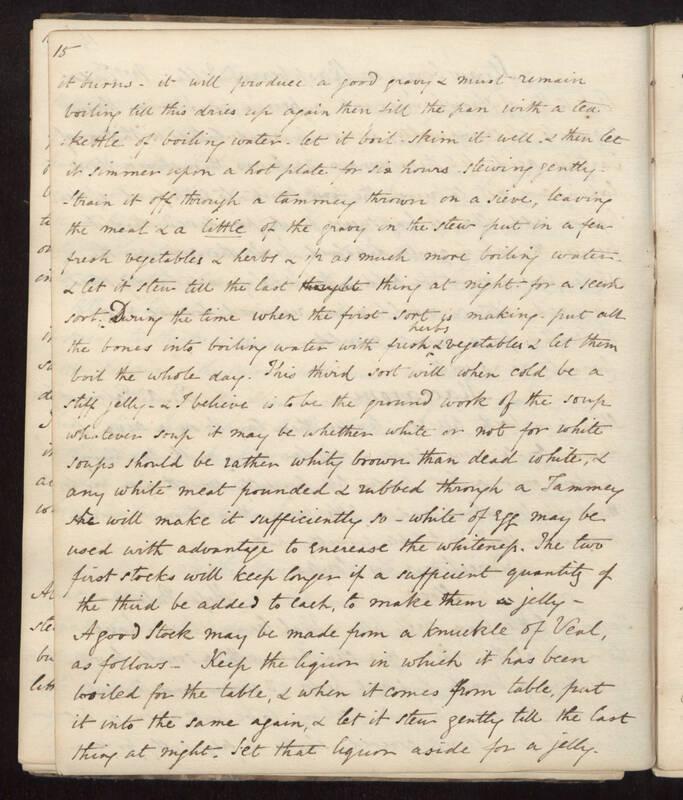 The two first stocks will keep longer if a sufficient quantity of the third be added to each, to make them jelly -- A good Stock may be made from a knuckle of Veal, as follows --- Keep the liquor in which it has been boiled for the table, & when it comes from table, put it into the same again, & let stew gently till the last thing at night. Set that liquor aside for a jelly.